Another show I’ve been meaning to watch! I’m so behind. Bullying a wimpy scholar. Oh, bravo. Big bad brave warrior. He’s a viking. This is kinda how they roll. Told ya. You need to use those brains of yours more, Ibrahim. Out of curiosity, since I too have a birthday on the weekend, is your birthday on the 22nd or 23rd? I did indeed have a good birthday, and I hope you did too. Tut tut., all that education Ibrahim, and you still miss that angle? Well, it IS his first excursion out of the country in a long time. And he’s had a rough day, being thrown into a harbor from who knows how far away and all. Okay, Coal worked up a slightly different version of the reply I’d forecast. But the ‘whassa caliph’ and ‘you’re staying’ parts are still there. Ibrahim’s just managed to dig himself in a little deeper, that’s all. I’m impressed with Ibrahim’s hat’s tenacity, by the way. It’s managed to stay on through a toss, a dunking, and now a vigorous facepalm. Superglue. Tis’ the only answer. Well, Coal IS kind of a dumbass and thus kind of predictable (at least in this sort of situation). Coal is just the smuggest jerk right now. Umm…. Vikinnnng. That’s kinda how they made their living, once upon a time. Between raids, pillages and the other ahem…. ‘niceties’ they visited upon the communities they….. ‘visited’. Hence, Dane-gild. It’s not like the Caliph amounts to a hill of beans outside the Caliphate, aside from his bulging coin purse. He never thought it’d be this easy. See see see? We all told you so. Please let him be joking. Coal won’t be letting go of Ibrahim until he knows he no longer needs him for his quest. Not to mention, an eternity in Valhalla is only as good as the tales you have to tell over the course of your stay. How many people can claim to have captured and ransomed a Prince after they’ve died? I love/hate Coal right now. And yeah, watching Ibrahim just dig himself deeper is amusing. Incidentally… what language are they both speaking right now? I’d assume Danish. I doubt Coal speaks any non-Scandinavian languages, and Ibrahim was told before he left home that it’d behoove him to learn Danish. Well, this might narrow the time period: Instead of sometime between the 7th and 11th century, it’ll have to be sometime between the 7th and 10th (the caliphate suffered a civil war that turned it in a buch of taifas, in the years 1009 to 1013). Haha, don’t worry too much about it. It’s just “the Viking Age” which is like 800 to 1100 CE. I’m not that worried about historical accuracy to pick just one year. Ah Ibrahim books smarts don’t necessarily equal to common sense. And thus, the facepalm was born! I told you, welcome to the crew. Y U no want welcome? You’re the linguist and probably the diplomat as well, judging by how well Coal does at both. Just because you’re stuck on a living boat with a “partial” einherjar, a norse trickster god, and a lady is no reason to be upset. He doesn’t deal with stress/change very well does he? Discomfiture puts hair on his chest! He’s not gonna hurl over the side, is he? 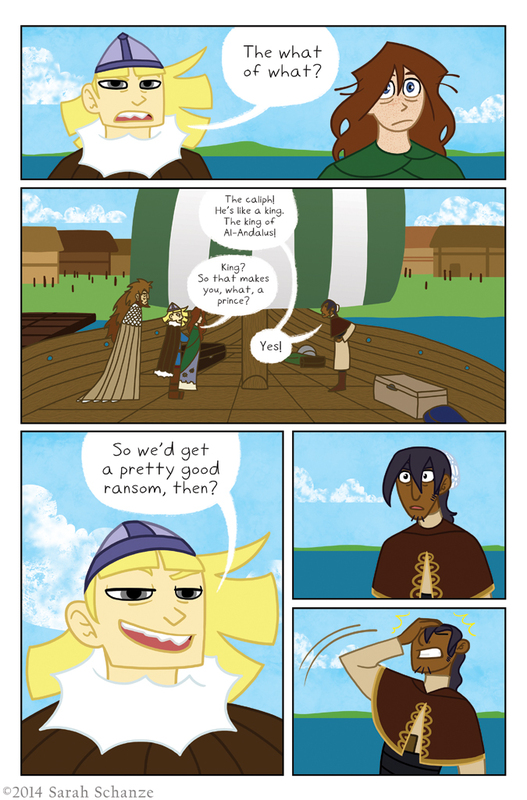 Lots of Davy Jones references for this page, haha. I think that it might be a little more subtle than that. Sarah seems to have a good handle on how the gods in Norse mythology worked. They weren’t necessarily “good” as we would call it and Loki definitely isn’t a traditional villainous figure. They were very much more of a order vs. chaos with the Jotun rather than good vs. evil. When Coal met with Odin etc, I didn’t get the feeling that they were particularly good ‘people’, though I wouldn’t say that Loki is particularly good either, just that he seems to value human life more than they do. I don’t usually comment, but this could not go unsaid: Coal in that bottom panel. I see that face and that yellow mane, and I hear young Simba’s voice from The Lion King. I was checking for a new page, and I saw an advertisement below the comic for Thistle Mistle Kistle. Advertising your webcomic on its site. Facepalm. I just gotta give it to coal.